Last week we received a request for a quote for a new parking lot that was to be put in a few miles away. After examining the request, we recognized the location of the job and were able to picture what was entailed. We followed up with the client and were able to meet with him at the job site, the next day. Our client explained to us that the entire location was in need of parking lot paving. It was a project that would require a first-class paving contractor. After providing a quick, and free estimate, our client decided that he was ready to move forward with the project. For a job that size, we would need time to prepare. We scheduled the parking lot paving to begin the following week. The next week our team returned to the job site to begin the asphalt paving process. Before beginning, we met with the customer again, and reviewed the details and schedule of the job, and set to begin. We had our work cut out for us as the parking lot had numerous potholes and severe alligator cracking. After a few days, we were putting the finishing touches on the parking lot. We spoke with the customer at the summation of the project. 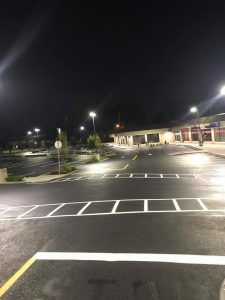 We explained to him that regular parking lot maintenance was important and that we could provide services such as pothole patching and crack sealing. Happy with the excellent work we had performed, he told us that he would contact us for any asphalt repair needs he might have. After a handshake, our crew was back on it’s way to the office.